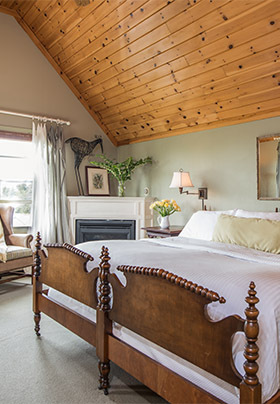 The main building of The Bradley Inn has 12 guest rooms that either look out to John’s Bay in the distance or onto the beautiful perennial gardens that grace the property. 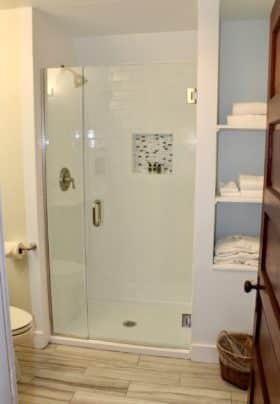 Each room of our New Harbor B&B is uniquely decorated and includes its own private bathroom. 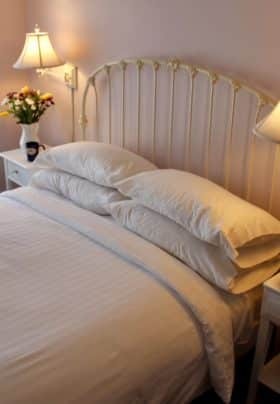 The nightly room rates are based upon double occupancy and include a full breakfast and afternoon tea. Deposit of the greater of one night plus tax or 50% of total stay will be taken upon booking. Cancellation policy: your deposit is fully refundable less a $30 processing fee if made prior to 14 days in advance of your arrival. The Slippery Hitch is a pleasant first-floor room decorated in shades of cream and white with tin wainscoting. This room offers a queen-size bed, a private bathroom with a tub/shower, comfy chairs, and a lovely view of the front garden. 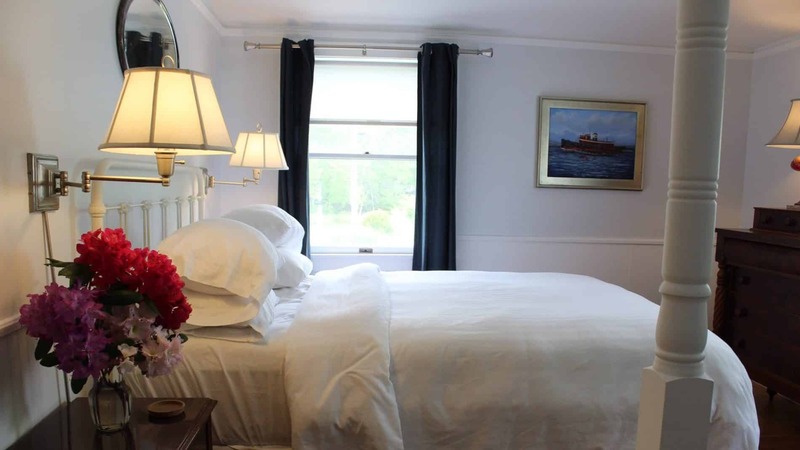 The Seafarer is a bright first-floor room, decorated in a navy and white nautical theme. It features a queen-size bed, newly finished original wide plank pine flooring, a private bathroom with a high toilet, newly tiled floor and a walk-in shower that contains grab bars, comfortable chairs, and windows overlooking the front garden and a prolific pear tree. Note a shower seat is available upon request. 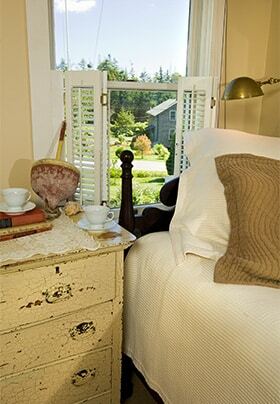 The Silk Road room offers gorgeous views of the back gardens and a peek of John’s Bay between the trees. 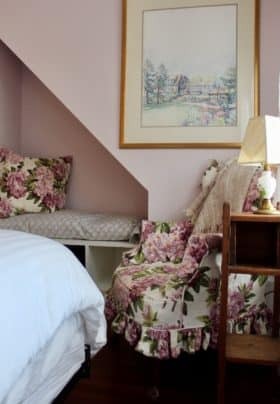 This peaches-and-cream wallpapered room is located on a corner of the second floor and features a queen-size bed, a private bathroom with a tub/shower, and a peaceful sitting area. Located on the second floor, the Periwinkle room is decorated a cool blue and white Victorian-style. It offers a queen-size bed, antique furniture, a spacious sitting area, and a private bathroom with a tub/shower. Guests will be able to catch a glimpse of John’s Bay through the trees. 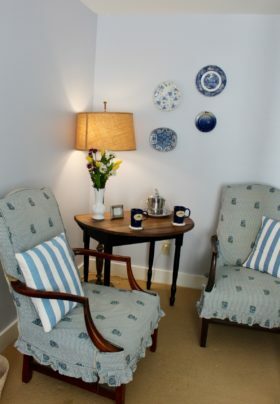 This second-floor room was named after the beach rose and is decorated in soft peach with navy blue accents. 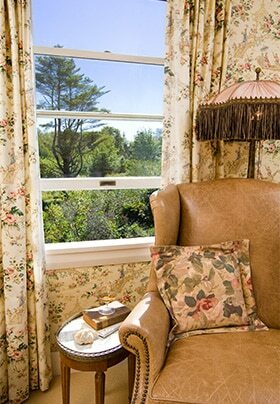 The Rugosa room overlooks the back gardens with a sneak peek of John’s Bay in the distance. It features a king-size bed, newly installed wide pine plank flooring, a spacious sitting area, and a private bathroom with a tub/shower. Note the pictures have not yet been updated as the renovation is still in progress. 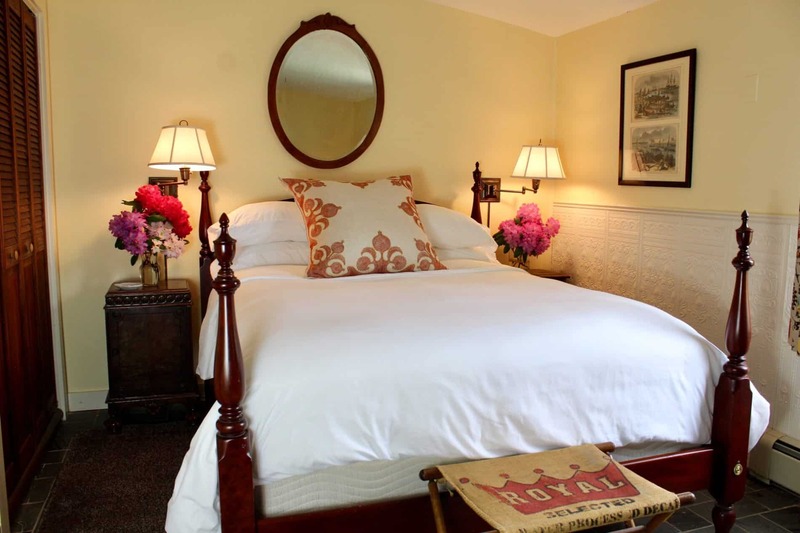 The Urchin is a compact and distinct room situated on the second floor of the inn. 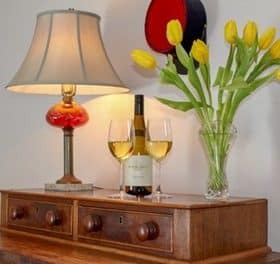 It offers acorn-post twin beds and unique Life Magazine memorabilia. The room also includes a private bathroom with a shower. 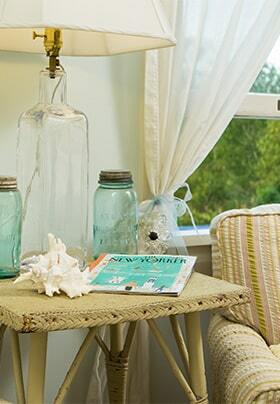 The Sea Glass is aptly named, as this bright second-floor corner room is painted a soothing pale green color. The room overlooks the front gardens, and features a queen-size bed and a private bathroom with a shower. This spacious third-floor corner room was named after a small island off the point. Inner Heron overlooks the back gardens and John’s Bay in the distance. 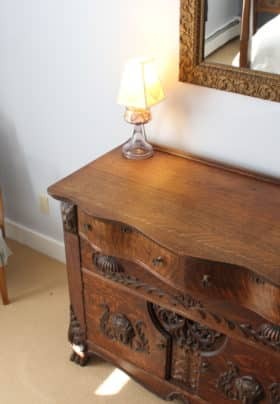 It features cathedral ceilings, a corner gas fireplace, an antique king-size bed, a spacious sitting area, and a private bathroom with a tub/shower. Bayview, newly renovated, is a spacious third-floor room decorated in sea greens and silver grays with cathedral ceilings. The room includes a corner gas fireplace, a king-size bed, a spacious sitting area, and a private bathroom with a beautifully tiled shower. Guests can enjoy a lovely view of the back gardens and a bit of John’s Bay in the distance. 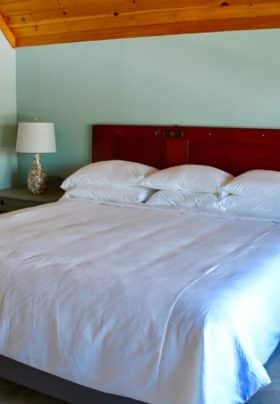 Please note that we wanted to share a pictures of the newly renovated room so we took some to share….note professional they are not, but you get the idea. 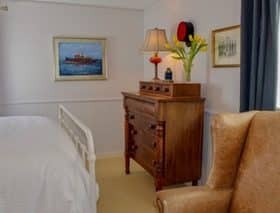 Nestled in the corner of the third floor, this spacious nautically themed room overlooks the back gardens and John’s Bay in the distance. The Longliner harbors many maritime artifacts, including a swordfish scrimshaw carving. It features cathedral ceilings, a corner gas fireplace, a queen-size four-poster bed, a spacious sitting area, and a private bathroom with a tub/shower. 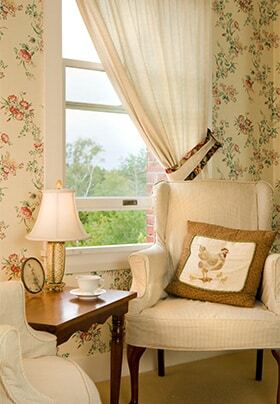 This pleasant pale lavender-colored third-floor room overlooks the front gardens. 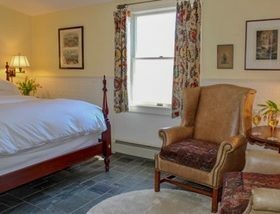 The Sea Lavender room features a queen-size bed, newly finished original hardwood floors, built in bench, wing-backed chair, and a private bathroom with a shower. 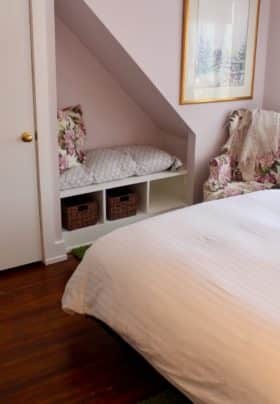 This bright third-floor corner room has a partial sloped ceiling, creating a cozy space for sleeping and sitting. 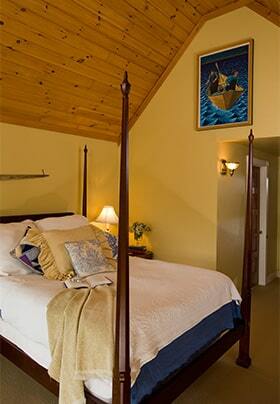 Wild Rose overlooks the front gardens, and features a queen-size bed and a private bathroom with a shower.